Dental Implants are the preferred tooth replacement procedure as they avoid many of the complications of other procedures. Dr. Pham has advanced training in both the placement and restoration of dental implants. Lasers are much more comfortable than traditional techniques and tend to be more effective and safe as they sterilize the area at the same time. We are proud to be able to offer modern dental procedures with our diode laser. Our entire office has been designed with your comfort in mind. 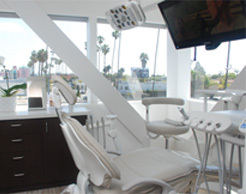 Our operatories have beautiful views of Santa Monica & big screen TVs available to watch your favorite program. We even have warm towels for you for a refreshing change. Now you can smile more during treatment with clear aligners from Invisalign™. In addition to being nearly invisable, Invisalign clear aligners are easily removable so that you can brush, floss and eat as usual. When you visit Meridien Dental, you will experience a different kind of dentistry. Dr. Peter Pham and his team are invested in your comfort and well being. It is very important to Dr. Pham to provide the utmost in patient care and he has undergone extensive training in all phases of dentistry to achieve this. Get the beautiful smile you're proud to show ear to ear in a relaxing, spa-like environment.